In a match that was originally scheduled to be played just over a month ago, Chicago now has the opportunity to seal their playoff spot. A win and they’re in, with a chance to wind up in third place and avoid the North Carolina-hosted semifinal. A draw will see them secure fourth place. A loss doesn’t mean it’s the end but makes Saturday’s game against Utah (the only other team still in the running) pivotal. In the driver’s seat for the desired result is forward Sam Kerr. With two games left to play (one more than any other team besides Sky Blue), she’s in the lead of the Golden Boot race with 14 goals, just three shy of last year’s record 17 and two ahead of Lynn Williams. Unless Kerr is uncharacteristically quiet for these last two matches and/or Williams has a field day against Houston this weekend, the honor is hers. 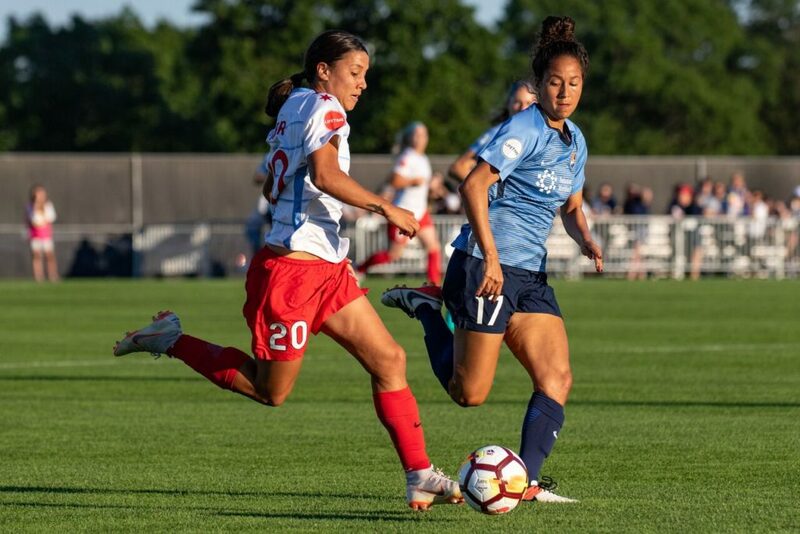 The last time these two teams played, no one could do anything against Kerr, who scored a hat trick to kick off the Red Stars’ current streak of six games unbeaten. Standing in her way? A Sky Blue side that played just two days ago and is missing several key players without the depth to make up for it. Sarah Killion had her best game of the season against Washington on Sunday, even before she scored a late rocket to equalize the match and steal a point. She’ll be crucial to intercepting key passes as Yuki Nagasato and Vanessa DiBernardo try to play Kerr in behind the defense. That defense had good individual moments against the Spirit, particularly from Amanda Frisbie and Mandy Freeman, the latter of whom has probably been Sky Blue’s most consistent defender, but couldn’t maintain a disciplined shape, which is a weakness tailor-made for a player like Kerr to exploit. Kailen Sheridan, too, needs to be on her toes, because she will almost assuredly be called upon for 1v1 saves. For Sky Blue, it’s going to be about weathering the storm, not letting themselves get stretched, and looking for opportunities on the counter.